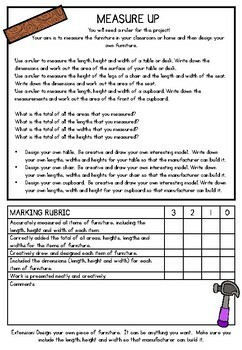 Inquiry Based Maths Assignment; Measure Up - Extend learning of measurement and basic operations with links to the real world. Grades 3-5. Enrich and extend your students' understanding of measurement and basic operations with this simple but effective measurement project. Students link their learning to real life by investigating the height, length and width of items of furniture in the room and then designing their own furniture. Perfect as an extension for those early finisher or just as an assignment at the end of a measurement unit. This worked beautifully for my more advanced students who needed a deeper learning of measurement.